Howdie to all of you who are following along in our home building process! We really didn’t think we’d be posting another one of these updates for a few more weeks but today was a big day. To give y’all some back story on today, we have felt a bit uneasy about one thing in this whole process. Everything has seriously been a dream, from our first meeting with our sales rep (Sharon) to getting approved and working with our loan officer (Liz), it has really been a blessing and so easy. If you read our last update, you know that we were walking into this thing a little nervous and gun shy. We have just been searching and pursuing so many different things that we were nervous that another door would be slammed in our faces. But God has been so faithful and has not only given us green lights, but you know that feeling when you’re driving on a road all alone, no one in the lanes next to you, green lights as far as you can see? Yeah, that’s how this feels. Such ease. But there was this one thing: our lot. When we arrived at our sales meeting in January, we knew they would only be opening up a few lots at a time. Ryan Homes likes to build in sections, so they only allow you to purchase a home on specific lots until they open the next section. Usually by then, the price on the home would go up. We knew we wanted to get in at the beginning price so we only had 5 or so options for lots. 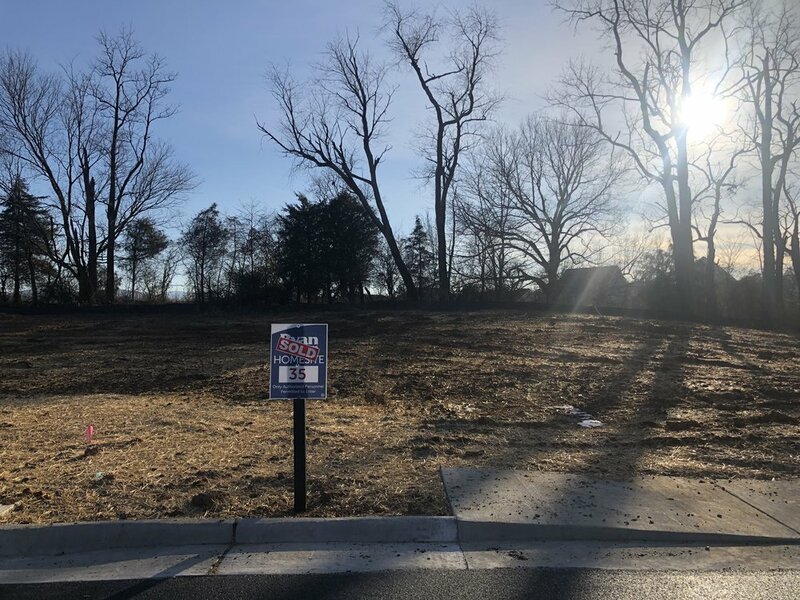 The one we chose was on the corner next to a retention pond (this will always remain this way so we can know for sure that we will never have neighbors on our right, so nice). We walked away so sure of our decision and so excited. But as I continued to pour over our lot and ya know, drive by and what not, I started to think, “it’s just not very big”. Will we have enough space in our backyard to fence in for Mia? Will we even have enough room for a patio? Where will the house go? I just couldn’t picture it. Our lot is verrrry wide (which means more space between us and our one neighbor), but a narrow area in the back that was making me nervous. And we were also a little worried about the plan for water drainage since the back of our lot is sloping down towards the back of the house. So we set up the meeting to talk about our concerns, and while we were chatting about meeting, our project manager suggested rolling our “pre-construction” meeting into our time so we don’t have to come out twice (little does he know, I’m out there more than a few times a week haha). When we arrived today, Justin (project manager) walked us to the lot and explained everyyyything that was happening with our lot. They had flagged the house site at this point too which was super helpful in seeing where our house would be and how much of the land it would take up. The front right flags are marking our driveway and corners of our garage. The left two flags and the back flags mark the corners and footprint of our house. There is definitely a narrow space between the black fencing and the back of our house but what I didn’t consider was the land that is behind the black fence is also ours. And there is a significant amount of space back there. They are also grading our land to have a “swale” which will direct any water away from our home. So we are SO happy & excited. Back at the model home, we had our meeting where we just went through all the pre-construction details. 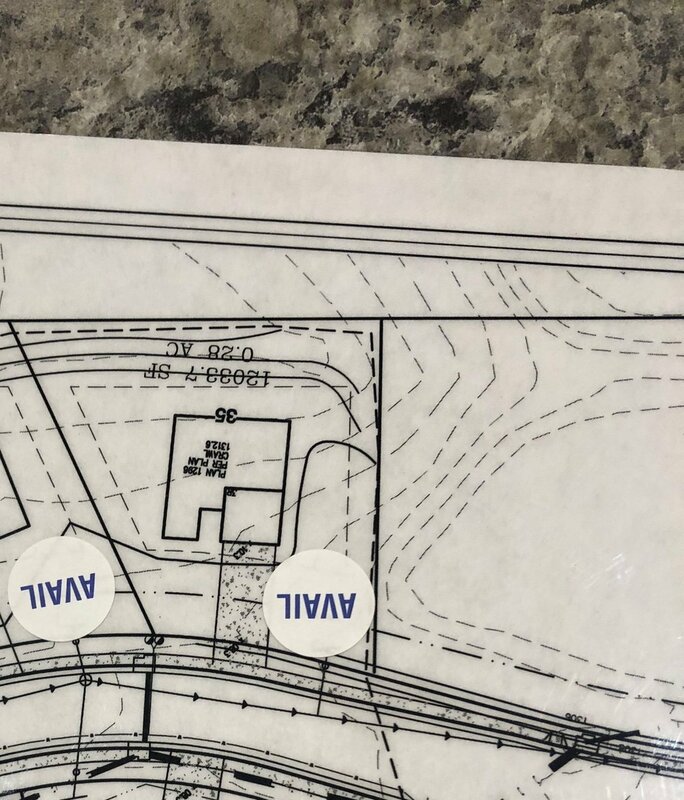 He confirmed all of our upgrades and showed us things like: our electrical map for the house, color schemes, blue prints, where certain key items are located within the house, smart home features that they include, and our estimated dates. This is the part we were soooo surprised about!!! We had planned on them breaking ground in March. But Justin told us today that they surprisingly got our permits early and that they would be ready to break ground next week. WHAT. This pushes our completion date up from June to May. Freaking out just a little bit over here. We will continue to update you guys & I’m excited to share our design plans once we finalize everything. The home is pretty cookie cutter so we’re taking a few weeks when we close to renovate certain areas and really give it the character we want it to have.